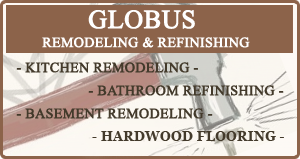 At Globus Remodeling we pride ourselves on our exquisitely detailed craftsmanship and our superior service. These are the two thing that put us head and shoulders above our competitors. Most of our clients want extraordinary results and we deliver. Our design team work with the latest technology to offer you unique custom designs that are tailor made for your home. We provide many different home remodeling services, browse through our services page to find the service that best suites your needs. You will not find a home remodeling company that takes as much pride in their work as we do. That is why the majority of our business comes from referrals from past customers who were satisfied with our work. Our goal is to turn your dreams into a reality and we will be with you from concept to completion. Our service areas include, New York City remodeling, Manhattan remodeling, Brooklyn remodeling, Upper East Side remodeling, Upper West Side remodeling, Lower Manhattan remodeling, Greenwich Village remodeling, Hell’s kitchen remodeling, and NYC remodeling. If you live in or around these areas and are in need of a home remodeling service give us a call.